D1240 passes under Wallington Station bridge nearing the final destination. 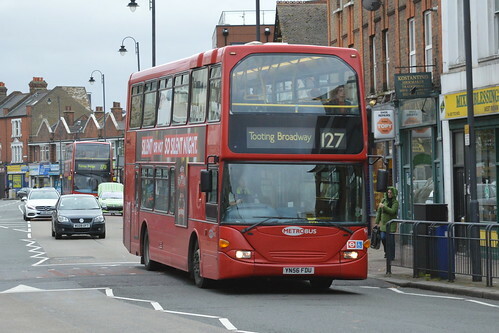 Northbound journeys diverted via Wallington Stn forecourt - and converted to single deck operation. 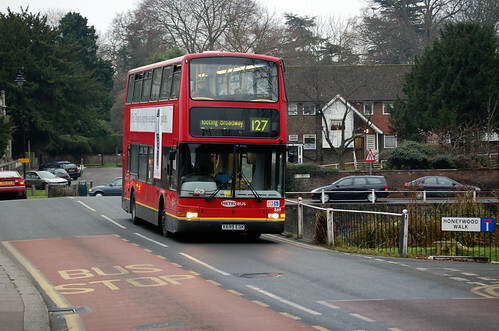 Diverted via Carshalton Station instead of direct via London Road and extended from Wallington to Purley via Route 234. 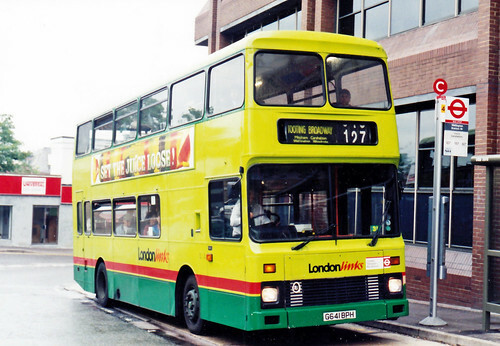 Mon-Fri peaks extended from Purley to Selsdon via withdrawn 234. Mon-Sat extended from Purley to Sanderstead Church. Certain garage journeys revised to run in service to Chelsham Garage. 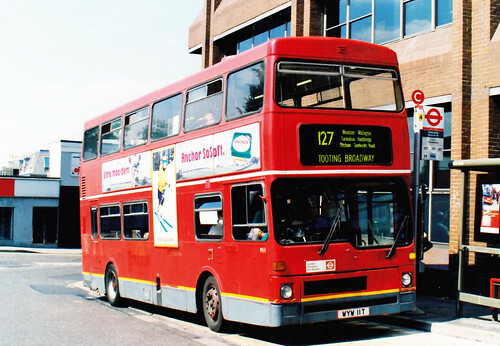 Sunday bifurcation withdrawn - Sunday service now the same as MS.
Withdrawn between Purley and Selsdon. 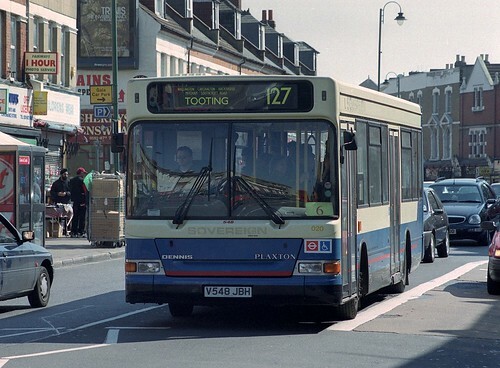 Rerouted in Tooting via Southcroft Road instead of London Road. Converted to single deck - new contract commenced. Selkent replaced by Blue Triangle. 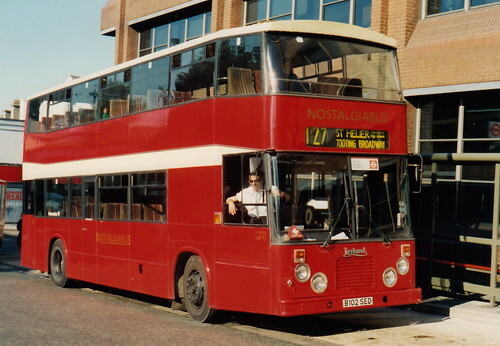 Contract reassigned to Mitcham Belle - Nostalgia withdrawn. Garage relocated to Beddington Lane. 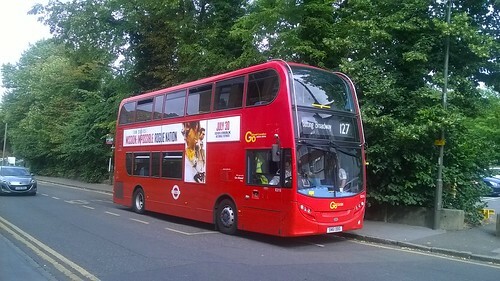 Vehicles loaned from London General operating from their new Croydon Base at 134 Beddington Lane (C) on Mon-Sat and Godstone on Sunday with Scanias. 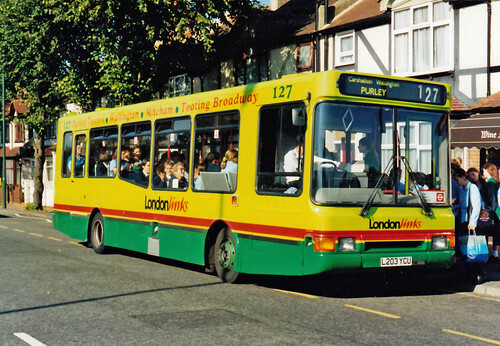 Loaned London Central PVL199 as Metrobus 869 on route 127 in North Street, Carshalton.